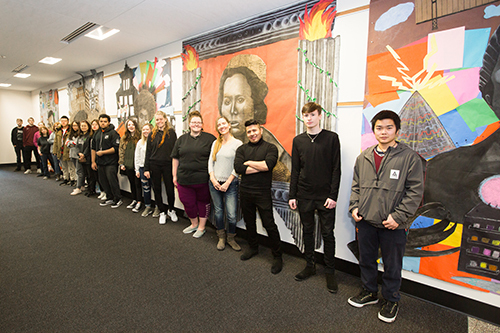 She presented her students with a list of artists of color from across the globe, and after narrowing down their subjects together, they took on something special: part research project, part collaborative work, they split into groups of five to construct large-scale portraits in mural form. From the surreally apocalyptic art of Chinese artist Zhong Biao to the colorful, urban Mexican-Aztec street art of Curiot, each mural emulates not only the styles and themes of the artist depicted, but also the cultural and political influences at play in their diverse and unique creations. The project allowed the drawing students to refine their portraiture technique and paid tribute to the sheer diversity of art in the world. Currently, the five murals can be found hanging in the Center for Student Success (Bldg. 22) in the hallway next to the Writing Center.